There is a 4" white matting board all around the piece. It is musem quality acid free with a thick ply wood, so the piece is set back a little and has some depth coming forward. 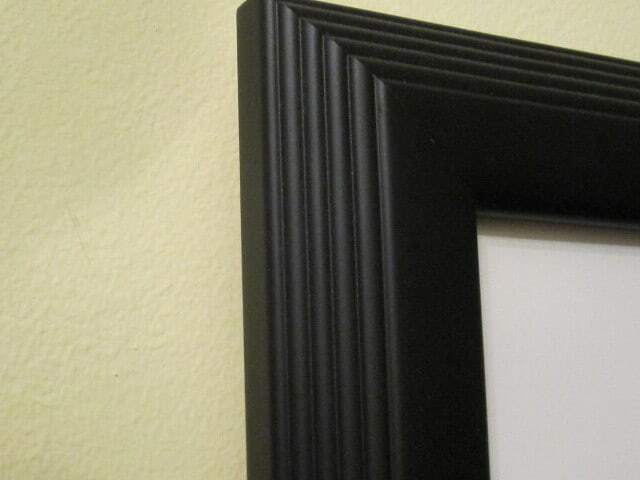 The frame is black wood 1.5" with 4 ridges within, that can be seen in the photograph. The actual art work is 10" 1/2 W X 8"H. The art work is encased in a non glare plexi glass that is light. 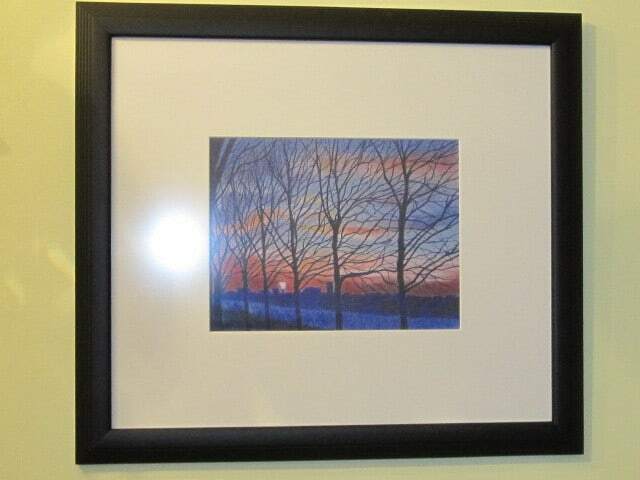 The separate photo of the piece shown, is closest to the original look. Expect the piece to be delivered within 2 weeks and I will let you know when it is dropped off to ship with the tracking info. You will have 7 days, once the piece is delivered to your location to return and for a full back money guarantee. 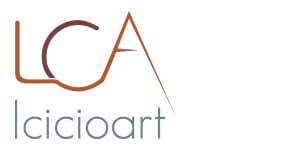 The cost of shipping back, and having the art piece insured will be required with the order #, date and transaction #. There is no refund for this. This should be done through a FedEx or UPS store. If something is damaged, please take a photo so I can view and you will get full refund once it is returned to me. I want you to be completely happy with my work! Feel free to contact me at 917 673-5871 or my personal email lcicio@nyc.rr.com and you will hear from me within 24 hours. Thank you for your business and appreciation of my art. 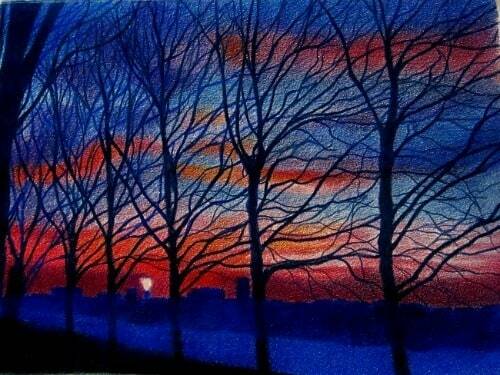 The trees of Wasington Heights, Northern Manhattan in the early evening as night settles in. I wanted to start learning how to draw the branches of trees as they grow naturally and bend. 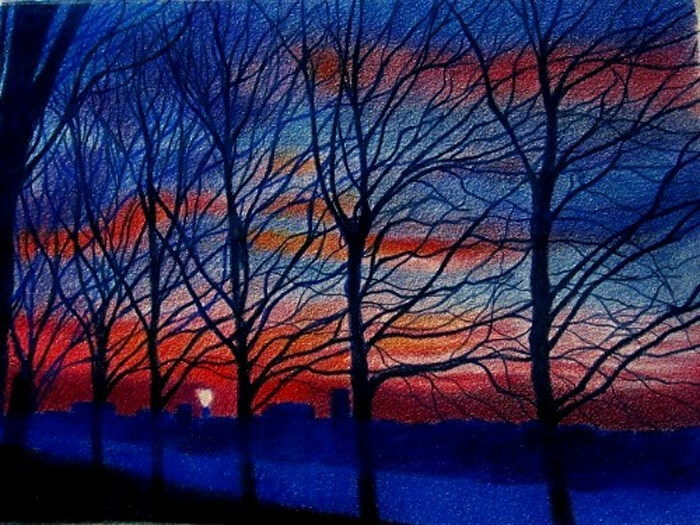 Just using 1 color for the tress, against a luminous night of blues, purples and reds to create a lush and a kind of fantasy evening. 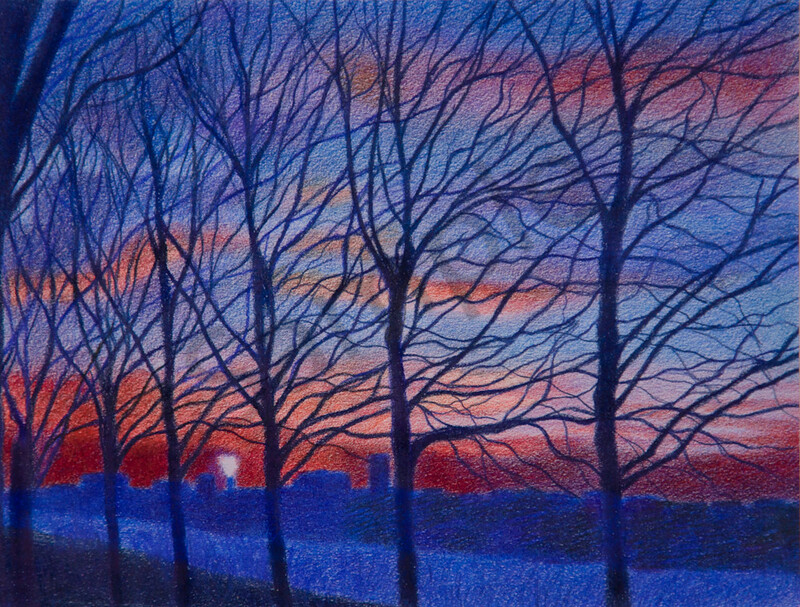 Done entirely in colored pencils I wanted it to be simple but dramatic. I will probably be coming back to this one again sometime, since I feel I am in my beginnings of learning how to draw trees. I came back to this one, after 6 years ago doing a pastel version of this rendering.